Passenger cars with a diesel engine had a 72% market share of the French market in August 2012, but they were down to 61% last month. The diesel engine has lost 11 points in the market in only two years! Considering diesel is on the rise most anywhere else (US and Japan), this calls for an explanation. It’s certainly true that the diesel engine is facing hard times because of strictening emission regulations. The technologies to make diesel engines compliant aren’t cheap. This adds to engines which are always heavier and bulkier than their gas counterparts. So nothing changes for large cars, but the business case of the small diesel car is getting shaky, and that’s the main reason behind the diesel drop in France. With the French economy in turmoil, the big car market has plunged. Out of the ten best-selling cars in France this year, seven offer the choice of a 3-cylinder gas engine. There are the gas cars drivers are buying. 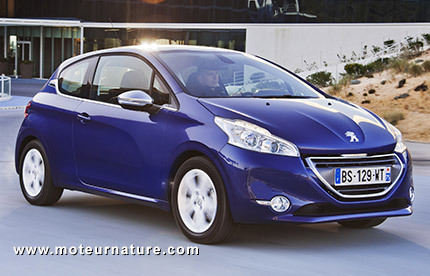 Small engines for small cars, such as the Peugeot 208 above, as the A and B segments (Chevrolet Spark and Sonic to an American), now make nearly half of the French market. Compared to the diesel which is often labeled as utilitarian, the gas engine is seen as fast and sporty, but that doesn’t describe the gas cars sold in France. Another sad thing is that electric cars do not benefit at all from the diesel drop. EV sales remain marginal in France, with a market share stagnating well below 1%.